Beef, potato and onion filled empanada with a pie-crust like exterior. The empanada was good but it was very small. Also, we’ve had empanadas where the meat is more flavorful. Still, a solid empanada but not spectacular. It also came with a chimichurri sauce that added a nice tang. Spinach, onion, mozzarella, and parmesan cheese stuffed empanada. Similar to the above-mentioned, but bolder flavors. The cheese and spinach went well together. 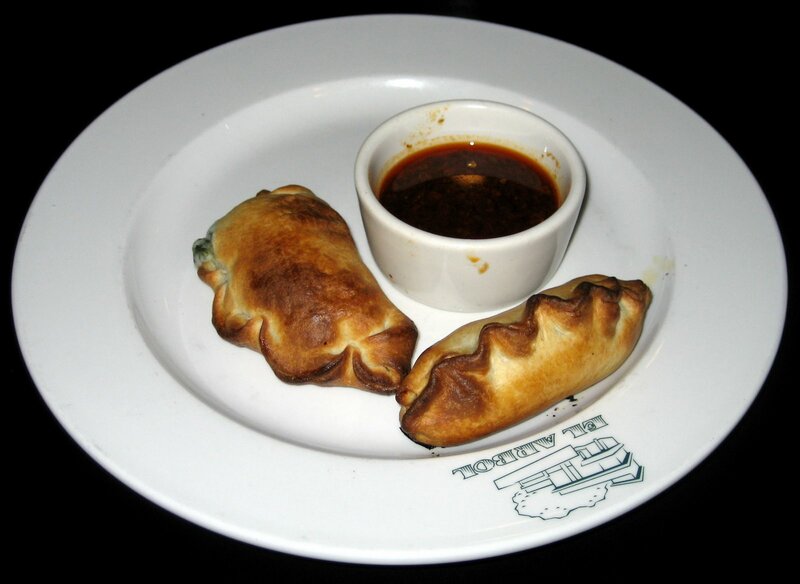 We just wish they were Texas sized empanadas! 8 oz. beef tenderloin prepared on an oak grill. 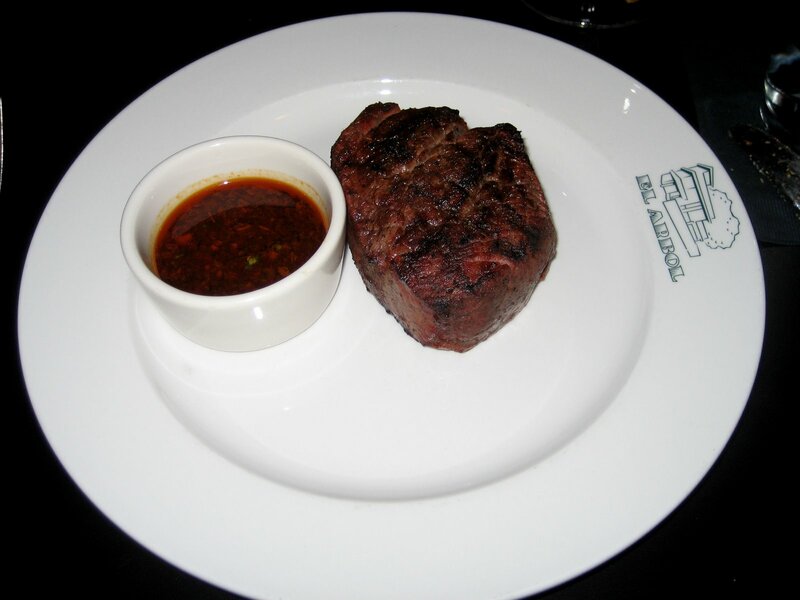 This filet is superb and definitely embodies Argentine cuisine. It was aged for 40 days beforehand, and use only salt and pepper to season it. We asked for it to be cooked medium, and that is exactly how it came out. 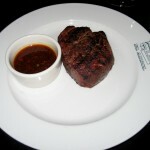 The oak wood grill provided a most delicious smoky flavor to this juicy tenderloin. This is the kind of filet that you dream about and crave the next day. This tenderloin came with a side of chimichurri sauce, but it really didn’t need any it at all. Next time we come to El Arbol, we will skip appetizers and just get two or three of these – yes it was that delicious! 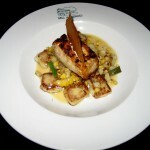 Oak-grilled escolar, herb manchego gnocchi, roasted corn, green garlic, fennel, almond tuile. 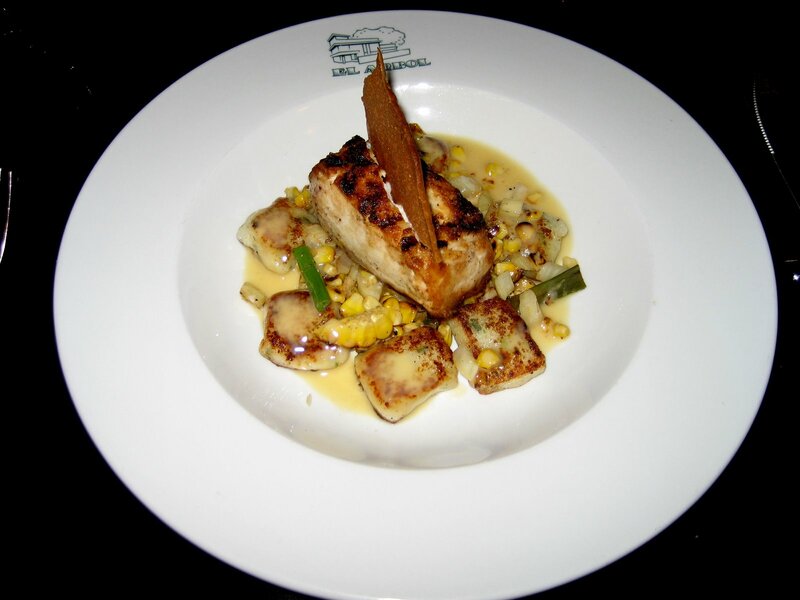 We had high hopes for the oak-grilled escolar, but it fell a little short. The escolar came out lukewarm instead of hot. For the most part it was soft and flaky, but a few pieces were tough and chewy. It had a very mild flavor and tasted better in bites that contained corn and fennel. The manchego gnocci really stood out in this dish – wonderful cheesy taste and texture. The tuile was a thin wafery cookie with a slight almond flavor to it. We made reservations for a weekday evening, and the restaurant was approximately half-full. We were taken to the 2nd floor and seated in one of the spacious corner booths. Our caipirinhas came out first, followed by our appetizers. It took a little while to get our entrees but we didn’t mind because it allowed us to check out the other floors of this beautiful restaurant. Our waiter was friendly and efficient and checked up on us at appropriate times. Our waters were refilled without us asking and were actually refilled too often! Overall the service here is professional and courteous. El Arbol is located in Central Austin in the medical district. When you enter, you will immediately notice their unique and modern-ness of the restaurant from the large windows overlooking 38th Street in the lobby. This massive restaurant has two floors of indoor seating and three outdoor levels. The first floor indoor seating has a more casual feel to it with its speckled-white tile floors. We weren’t a fan of this look, especially for this caliber restaurant. The lighting was too bright and it had a somewhat generic feel to it. Also, this area was located close to the kitchen which can be noisy at times. The second floor was a different story. There was a generous bar area with TVs, but also a very elegant dining room with large leather booths and dim lighting. El Arbol has a regal and upscale feel which goes well with the types of food they offer here. A very popular seating option is at one of the three outdoor levels. The sprawling oak tree is the centerpiece of this area and would provide necessary shade in the summertime. Glowing white globes hang from the tree branches, providing soft ambient lighting while dining. Complimentary valet parking is available which is helpful since street parking is very limited. El Arbol is great for couples as well as for groups. Whether you want to sit back and relax outdoors while sipping on a caipirinha, or celebrate a special occasion, be sure to visit El Arbol!